I am probably posting on the blog after 2 years or so. Sorry for the delay. I hope I would be able to re-run the blog more frequently once I get into a college. 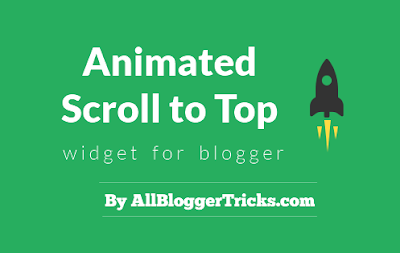 The following scroll to top widget is sleak, clean elegant and super easy to add in your blog. The best part is that you can add any other icon you want. WoW Nice, Can I add this widget code in WordPress blog ? Actually you can! WordPress too allows you add such a widget. To do so, go to Appereances -> Widgets And add a Text widget and paste the given HTML code. Make sure you drag the widget to bottom most area a widget can be(optional). why encrypt the codes ? The code is not encrypted. I presume you are seeing the img source and saying so. The base 64 is another way of representing a small image. The benefit is that it does not require to contact the server for downloading the image. Its fast and can be resized to the desired dimensions. and how can i change the rockets color to #9900ff ??? This Tutorial is so helpful for all of us! Its not working. Can you fix it? Gold the games with me. nice widget thanks i really like it. wow awesome, good blog post, i need this for my blog. Thanks For the Awesome Post.. Nicely Written..! Homemade Pizza-how to make mini pizza at home without microwave oven, make mini bread pizza it very easy and simple to make, see full pizza recipe on this video you can make this at home.veg cheese pizza starters for party quick recipe. Thankyou so very much for this. I have added go to top code in my tutorial blog.